Contemporary two storey design for an off grid home in rural Victoria. The ground floor will be clad with field stone from the site and includes an array of passive solar design and livable design features. The home will include a lift to access the upstairs living area, which has been designed to capture the extraordinary views. North facing skillion roof will be fitted with an array of PVs for renewable energy generation and the battery storage is located in the garage. Contemporary solar passive designed family home. Exposed concrete slab in north facing living areas, north facing internal brick wall and highlight windows. 5KW of Photovoltaic panels and large rainwater tanks. All electric and 7.4 star home. Two homes under 17 squares, 3 bedrooms, two bathrooms, lightweight construction in Kew (Victoria). The designs are two storey, with a combination of skillion and flat rooves and living areas orientated north. Sustainable features include: double glazed windows throughout, exposed concrete slab for thermal mass, high insulation in walls and ceiling, LED lighting, induction cooking, ventilation system, ceiling fans, photovoltaic panels, Herschel heater panels and rainwater tanks, vegetable gardens and fruit trees. 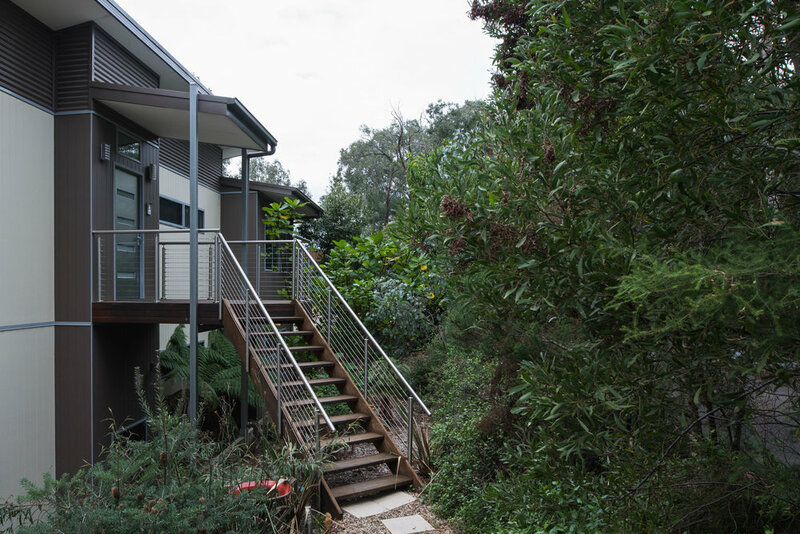 Design for a two storey home with living upstairs in the tree tops, 4 bedrooms, 2+ bathrooms, ground floor and upstairs living areas orientated north, lightweight cladding and opposing skillion roof. Sustainable features include: reused timber flooring, LED lighting, solar hot water, photovoltaic panels, ventilation system, ceiling fans, exposed concrete slab, awnings, wide eaves, 15,000 rainwater tank and plumbing for future greywater. Semi Urban Living. Under construction - A single storey solar passive designed home with all rooms having a north aspect to the Victorian Alps. Off grid, exposed concrete slab, double glazed uPVC windows and doors, constructed with Thermacell blocks and Bondor Roof panels. 3 bedroom and 2 bathroom home. Buln Buln - Rural living. Under construction - A single storey solar passive designed home zoned with living, meals and kitchen facing north, 3 bedrooms and 2 bathrooms. Internal brick wall for thermal mass, weathertex cladding, colorbond skillion roof, 5kW PVs on north facing garage roof, rainwater tanks, native and vegetable garden, herschel heating panels, ceiling fans, high insulation and thermally broken double glazed windows. Lancefield - Township living. 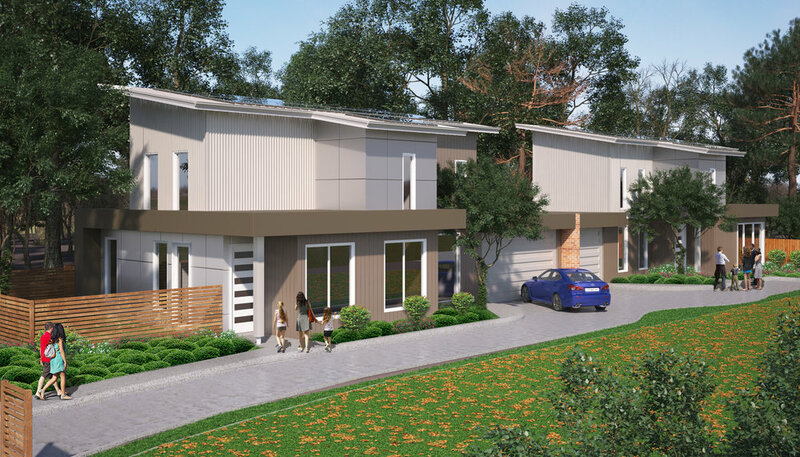 Soon to be constructed - A single storey solar passive designed home which is zoned with living, meals and kitchen and sitting area facing north. Lightweight cladding and multifaceted roof lines. 5kW PV panels on north facing roof, rainwater tanks, ceiling fans, timber flooring throughout and uPVC double glazed windows. Anglesea - Township living. Soon to be constructed - A two storey solar passive designed home zoned with living, meals and kitchen and sitting area facing north. Lightweight cladding and opposing skillion roof lines. 5kW PV panels on north facing roof, rainwater tanks, ceiling fans, timber flooring in living areas, heat pump hot water system, Herschel heater panels and double glazed windows and doors throughout. Anglesea - Township living. A modest 3 bedroom, two bathroom, single storey home with living area orientated north, skillion roof northern deck and Colorbond cladding. Sustainable features include: double glazed windows, 80,000 litre rainwater tank, onsite wastewater treatment, LED lighting, Solar Hot Water, induction cooking and photovoltaic panels. Rural Living. A modest, 3 bedroom, two bathroom, single storey home with living orientated north, Colorbond cladding and skillion roof. Sustainable features include: double glazed windows, 35,000 litre rainwater capture and onsite wastewater treatment. Conservation Living. Assessed 40 homes in Multiple Design Stages for a retirement home in the Geelong region.